The Great American West region encompasses over 62 scenic byways, backways and highways. As you experience the region, make sure to take the scenic route! For a holiday that harkens back to the frontier days of old, there’s no better destination than The Great American West region. Begin your adventure in the gateway cities of Minneapolis/St. Paul/Bloomington, travelling west to Fargo, North Dakota. Admire the exhibits at the Plains Art Museum and the vintage and contemporary aircraft at the Fargo Air Museum, then continue on to Jamestown, home of the popular Frontier Village and National Buffalo Museum. Continuing west, visit the state capital of Bismarck, where visitors will find the State Museum at the North Dakota Heritage Center, before experiencing frontier life just as General George Custer did at nearby Fort Abraham Lincoln State Park. Then travel on to Washburn and walk in the footsteps of Lewis and Clark at the Lewis & Clark Interpretive Center and Fort Mandan before continuing west to Medora, home of the popular Western extravaganza, the Medora Musical, and the entrance to Theodore Roosevelt National Park. Cross the state border into Montana and travel toward Billings, visiting the Little Bighorn Battlefield and Pompeys Pillar National Monuments. Continue westward to Bozeman – known for its Museum of the Rockies – and the historic copper mining town of Butte before visiting the twin Old West towns of Virginia City and Nevada City. Continue west and follow the curve north to visit Wallace, Idaho, the charming mining town known as the “Silver Capital of the World,” and Coeur d’Alene’s Old Mission State Park. Head south towards Lewiston for the Nez Perce (Nee-Me-Poo) National Historic Trail for an intimate look at the stories and historical objects of the Nez Perce people. Stay southbound through Boise to see the Idaho State Museum and on to Glenns Ferry to walk in the preserved ruts from wagons traveling the Oregon Trail. Arch across southern Idaho for City of Rocks National Reserve and Massacre Rock State Park, both great places to see more Oregon Trail and California Trail pioneer history and markings. Loop up to Idaho Falls for Native American, Lewis & Clark and atomic power exhibits at Museum of Idaho. Then head northwest to Cody, Wyoming: Named for Wild West showman Buffalo Bill Cody, the town is home to the Buffalo Bill Center of the West, a highly regarded museum considered by many to be the “Smithsonian of the West.” And true to Buffalo Bill’s legacy, Cody is also known for its nightly summer rodeos and the entertaining Cody Wild West Show. Enjoy Cody’s down-home entertainment before travelling east to historic Sheridan and Casper, then visit Wyoming’s state capital of Cheyenne: See the sights aboard the Cheyenne Street Railway Trolley, or take in the summertime Cheyenne Frontier Days rodeo, one of the largest outdoor rodeo extravaganzas in the world. From Cheyenne, head north into South Dakota to visit the Gold Rush-era town of Deadwood. Experience what life must have been like in a Wild West boomtown before visiting Rapid City – gateway to Mount Rushmore National Memorial, the Black Hills and Badlands National Park. Continue east to Fort Pierre, home of the Casey Tibbs South Dakota Rodeo Center, a museum dedicated to rodeo. Then visit De Smet, site of the original Ingalls Family homestead immortalized in Laura Ingalls Wilder’s Little House on the Prairie books. Conclude your Western holiday once again in Minneapolis/St. Paul/Bloomington, enjoying the numerous shops, restaurants and attractions. The Great American West region is home to numerous national parks, monuments and memorials that preserve the nation’s natural resources and rich heritage. Beginning and ending in Denver, Colorado – one of the region’s major international gateways – the following itinerary visits many of the area’s most spectacular sites. 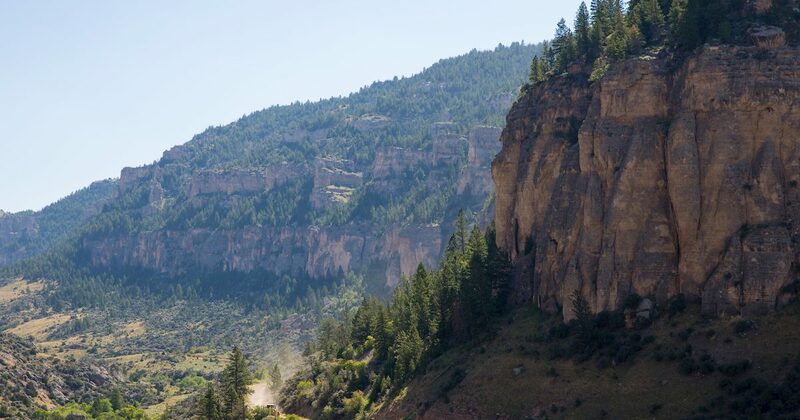 Beginning in Denver, travel north to visit Wyoming’s Flaming Gorge National Recreation Area, continuing on to view the ancient fossils at Fossil Butte National Monument. Then travel north to visit two of America’s most popular and scenic parks: Grand Teton National Park and Yellowstone National Park. From hiking and mountain climbing to fishing, boating and more, both parks offer visitors countless opportunities for outdoor recreation amid some of the most beautiful scenery found anywhere in the West. For a trio of natural wonders, head west to first hit the Sawtooth National Recreation Area which includes the Sawtooth Wilderness, Hemingway-Boulders Wilderness and Cecil D. Andrus-White Clouds Wilderness areas and the headwaters of the Salmon River – the River of No Return. Next, venture north to Craters of the Moon National Monument and Preserve to witness dramatic lava flows and caves, plus noteworthy star gazing at this designated International Dark Sky Park. Wander northwest to experience the deepest river canyon in North America at Hells Canyon National Recreation Area. Each location provides its own blend of spectacular scenery and outdoor adventure, including hiking, mountain biking, birding, boating and more. For even more picturesque vistas, continue northward to Montana’s famed Glacier National Park. Known as the “Crown of the Continent,” this stunning park perched along the Canadian border offers a million acres in which to hike, camp, fish and view wildlife. Spend some time enjoying Glacier’s spectacular landscape before travelling southeast to the Billings area. Visit the Little Bighorn Battlefield National Monument – the site of the infamous “Custer’s Last Stand” – then view Pompeys Pillar National Monument, which bears one of the last surviving markers of the famous Lewis and Clark expedition. From Billings, head east into North Dakota, home of Theodore Roosevelt National Park. Visit Roosevelt’s Maltese Cross cabin, then go hiking or camping in the park before continuing eastward to the Knife River Indian Villages National Historic Site, where visitors can witness the ruins of an ancient Indian village. Next, journey to South Dakota’s Badlands National Park, famed for its striking rock formations. The park’s 244,000 acres are home to a variety of wildlife, including bison, deer and bighorn sheep. Continue on to the Black Hills to explore some of the world’s longest caves at Wind Cave National Park and Jewel Cave National Monument, then visit the beloved Mount Rushmore National Memorial. To conclude your Western odyssey, travel back into Wyoming to visit the iconic Devils Tower National Monument – made famous in the film Close Encounters of the Third Kind – before travelling southward back to your gateway city of Denver. South Dakota’s scenic drives are well worth the extra tank of gas. The wind in your hair, an open road ahead and nothing but breathtaking views out every window? 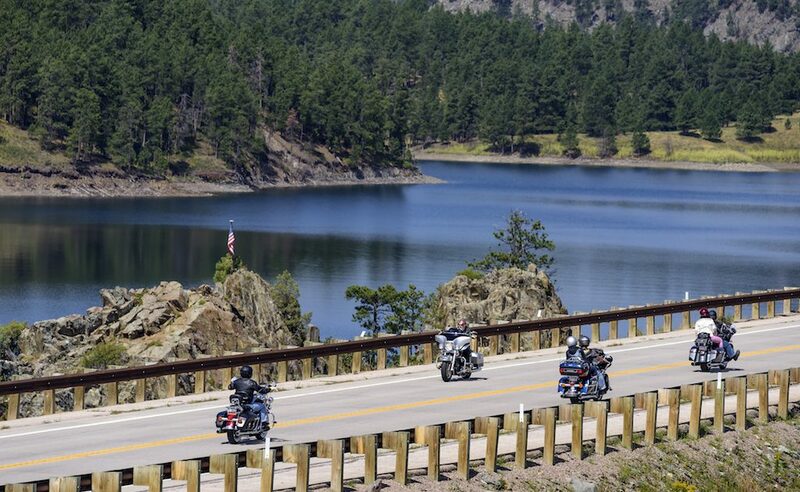 It’s freedom at its finest, whether you’re threading a Pigtail Bridge in Custer State Park, following the Missouri River through the lands of five Native American tribes, or taking the backroads to discover rural America. Visitors looking for an especially beautiful cruise should consider Peter Norbeck National Scenic Byway. Composed of some of the most incredible roads in the state and beyond, this roughly figure-eight route travels through portions of Custer State Park & the Norbeck Wildlife Preserve and takes drivers near Mount Rushmore National Memorial and the Black Elk National Wilderness Area. (Highways 16A, 244, 89 and 87 combine to create the route.) Norbeck, a visionary South Dakota senator and governor, personally chose the layout of the Iron Mountain Road in the 1930s and persisted in building it, even after being told it couldn’t be done. A masterpiece of artistic engineering, this 70-mile byway includes spiraling bridges, hairpin curves, granite tunnels and awe-inspiring views. Unsurprisingly, it was named one of the 10 Most Outstanding Byways in America. Shaggy white mountain goats, deer and chipmunks are among the commonly-seen wildlife along the way. You will want to devote most of a day’s time to the Peter Norbeck National Scenic Byway. Count on many stops for photographs along the way and a visit to Mount Rushmore National Memorial. So many other routes await your discovery. In Badlands National Park, the Badlands Loop Scenic Byway is a 39-mile loop between the towns of Cactus Flat and Wall where you’ll see the breathtaking rock formations and native grasslands filled with numerous species of plants and animals. Plan plenty of time to stop to take photos along the way. There are 16 designated scenic overlooks that provide plenty of chances to pull over and enjoy the views. Road warriors and motorcycle enthusiasts welcome. Idaho has 31 scenic byways stretching over 2,400 miles of desert, forest, mountainous highways and country roads. With historical trails, access to remote outdoor adventures and the beauty of a diverse natural landscape, every byway and back country road tells its own story. Take in the views of northern lakes and mountains on the Lake Coeur d’Alene Scenic Byway, see the deepest river gorge and ancient petroglyphs on the Hells Canyon Scenic Byway, travel on the Sacajawea Historic Byway with the spirit of Sacajawea and the Lewis & Clark Expedition or descend into southern Idaho on the City of Rocks Back Country Byway to visit the mountain climbing and hiking playground.